When hiking in the wilderness or even just in the countryside, trails are essential. It is possible to go off trail, but it is hard work if the area is overgrown, and there's always the danger of getting lost or going in circles. Finding any trail can be a great relief, and finding the trail you planned to be on can be even better. When trails become familiar and well-travelled, they gain their own character, and you have a relationship with them. You notice how they look different as the seasons change, and in the long term, how they change over time. Trails are not just for humans. Many animals use trails, often walking one behind the other, and this is important to their moving around. So understanding trails starts not with human history but with animal ecology. 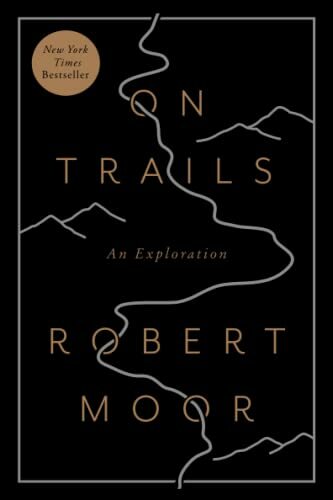 Robert Moore sets out what we know about the science of trails, but also the role of trails in literature and religion, and even issues of environmentalism, industrialization, and climate change. He has hiked trails all over the world, so he has many stories of life on the trail. He also has interviewed many scientists and explorers whose work is relevant to trails. His approach is broad and he doesn't have a particular thesis to defend, except that trails are important. The narrative includes all sorts of loosely connected facts, and he has plenty of tales to tell, which make the book entertaining, although one can often wish that he had kept the thread of ideas a bit more constrained. On Trails will mostly appeal to hikers and walkers who are curious about the role of trails in modern life, how they got created, who they were for, and what they tell us about our world. The performance of the unabridged audiobook by Jason Graysel is good but his foreign accents and the voices he uses for quotations are bizarre, adding an unintended humor to the book.